Sam, the founding hero of the Super Sam Foundation, wanted nothing more than to help "All the Kids". In fulfilling his final wish, the Foundation focuses on raising awareness, funding research, and supporting families in their fight against pediatric cancer. Watch the video below to hear more about Sam and the incredible work that the Super Sam Foundation is doing. When Sam was undergoing treatment, he wanted to focus on the positive and help "to make all the kids comfortable" while they were in the hospital. Sam's goal was to send 100 comfort packs to other children in need to represent the 100 days of isolation that he would endure during his bone marrow transplant. To date, the Super Sam Foundation has sent over 1,500 comfort packs across the country and even some overseas. The items that brought comfort to Sam were super-soft blankets to soothe sensitive skin, a stuffed animal to provide companionship in the absence of family and movies for entertainment. Each pack is customized to suit the needs of the individual receiving it and contains a blanket, a stuffed animal, and iTunes gift cards. Sam's twin sister Ava plays a special part in supporting the Foundation, and believes that "cancer is a family fight." 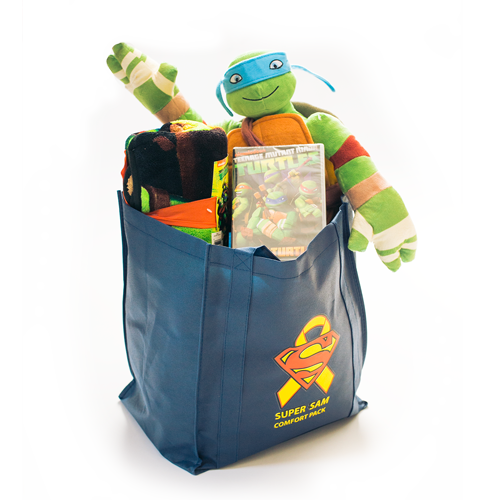 Sibling packs are filled with items that help support children who are struggling to understand and cope with the sickness of a sibling. Included are "crazy socks" that can be worn when life is feeling crazy and out-of-sorts, a journal and writing utensils for an outlet to express thoughts that are hard to say out loud, and a small stuffed animal to be by their side in the absence of their sibling. These are all put into a sling backpack that's perfect for transporting things during hospital visits. Designed to help ease the burden for parents and "super moms", a tote is filled with handy items including gift cards for gas or meals, laundry items, a notebook, a soft blanket, and high-quality facial cleaners or skin care. Specially packed to cater to the needs of each caretaker. Leading up to the Breakfast with Bev Benefit on December 5th, we are doing a comfort pack drive to collect new items to help fill packs. Dropboxes will be located at House of Brokers Realty, Columbia Board of Realtors, Landmark Bank's Home Loan Center, and Landmark Bank's Downtown Location. We will also accept items at the breakfast! Plan to join us December 5th!